Thank your comments and favs on yesterdays photo of Holly, I really appreciate it. Poor little thing - looks so cold! Great dof - the muted tones really show up his colors. Lovely. Nice focal point on the face. lovely. Lovely shot. I think he'll be happy to see the spring. This bird doesn't look impressed with the weather yet. Then again, it could be that thorny tree that's made him grumpy. Yikes, how does a bird manage to land without jabbing itself?!! Love the splash of colour on him. Sweet capture! I assume it is a redpoll - you must have them there too. Lovely color and detail. 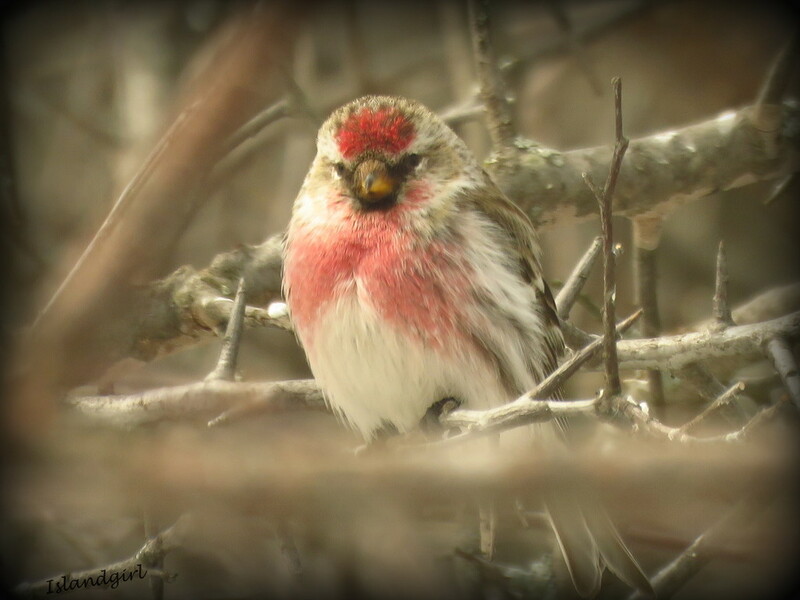 @linah thanks for dropping by Linda, this is a Redpoll and we have tons of them at our feeders right now! Great capture. Love the fluffed feathers! Love the light and the focus here, fav, and congrats on making the PP! He looks to be all puffed up. They are so cute with their red patches. Beautiful capture. Wonderful shot of a cute bird. I love this shot Kathy! The bird and focus are beautiful! Fav! beautiful little guy, great pose!